After the death of Joseph Stalin, the Soviet state’s iron grip on filmmakers began to loosen. 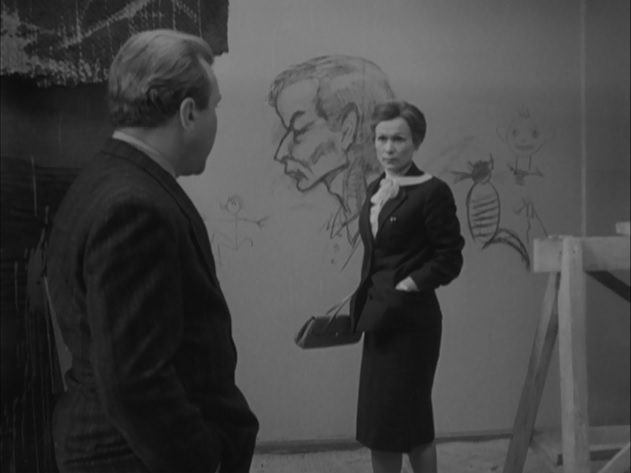 Nikita Kruschev actively encouraged more freedom in the arts, and in the mid-fifties Soviet cinema began to flourish once again. Realizing that the public was weary of whitewashed historical spectacles where the noble worker always triumphed, filmmakers chose to create more intimate works that focussed on individuals. Larisa Shepitko was one of the young filmmakers who embraced this new approach. A graduate of VGIK, the Soviet film school, Shepitko’s work places more emphasis on people than politics, though her characters’ conflicts are played out against the background of the world they live in. Wings is the story of Nadezhda, once a celebrated pilot in the Russian Air Force, now headmistress at a school. She’s intelligent, dedicated and hardworking, but she can’t escape the feeling that her life is empty. In the opening shot we see a tailor measuring her for a coat, and this slow, methodical process sums up the monotony that characterizes her life. The screenplay, by Valentin Ezhov and Natalya Ryazantseva, digs deep into the mind and spirit of this complicated woman. We see that she’s a smart, capable administrator, but she can’t relate to the young people who surround her at the school. We see her spending time with a male friend who obviously adores her, but she seems faintly bored by his company. The most important thing in her life is her relationship with her daughter, Tanya. Nadezhda desperately wants to be close to Tanya. But the mother is so judgmental, so controlling, that she’s continually pushing her daughter away. The headmistress discovers an unflattering caricature. It’s not that Nadezhda can’t feel love, or even that she can’t show love. Throughout the film she tries to connect with the people around her, but in the end she always insists that they adhere to her standards. What makes it even harder to bear is that she knows this. Nadezhda sees what she’s doing, and still can’t stop herself. And so there’s a constant tension inside of her. She’s always feeling the need to reach out and it’s always trumped by the need to maintain control. The only moments where we see her relax, where we see her step outside of herself, are the wistful reveries where she imagines herself flying again. In these lovely, lyrical sequences, we’re floating with her through the air, gliding peacefully past billowing, white clouds. The only sound we hear is a sad, lilting motif played on strings that underscores her longing for the freedom she felt soaring through the sky. While Shepitko uses music sparingly, it’s an important part of the film’s emotional fabric. The composer, Roman Ledenyov, shows an intuitive understanding of what’s needed. It’s a small scale score, well suited to this intimate exploration of a woman’s life. A quiet conversation is accompanied by an airy passage played on celeste. As Nadezhda rides a crowded bus we hear woodwinds playing a vague, dissonant cue. The only time when the score seems to open up is when she remembers the freedom of flying through the skies. The short, ethereal phrases played by the strings in these sequences suggest a sense of peace, but also a heavy melancholy. 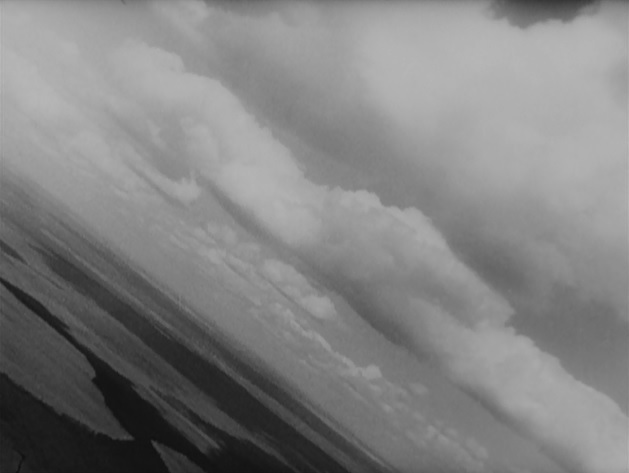 In the final sequence, Nadezhda visits the airfield she knows from her days as a pilot. As a lark, some of the young people who are learning to fly put her in the cockpit of a small plane and push it across the field. They mean it as an affectionate joke. For her, knowing that they see her as an old woman, past her prime, it’s humiliating. So just before they roll her plane into the hangar, she starts the engine, taxis down the runway and takes off into the sky. It’s a brief escape. When she returns to earth again, all her burdens will be as heavy as before. But for a while she can remember what it’s like to soar above the clouds. For a moment, she’s free again. Longing for the freedom of the sky.